B Roll is a weekly column that digs into the deeper cuts and lesser-known films from legendary directors–the good, the bad, and the awesome. 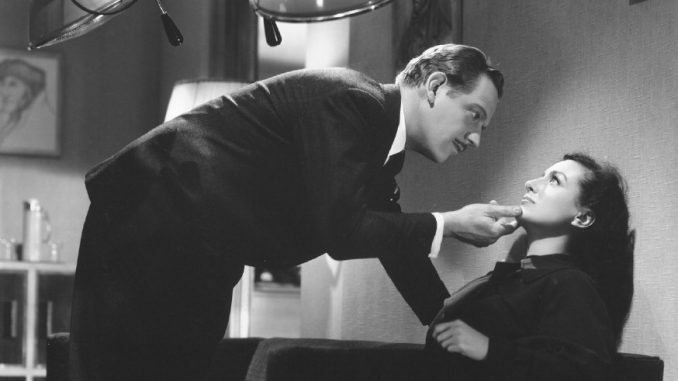 This week, writer Nathanael Hood looks at George Cukor’s 1941 film noir A Woman’s Face. There was always a darker side to George Cukor. Sandwiched in-between the “important” literary adaptations (e.g. Little Women , David Copperfield ) and audience-pleasing romantic comedies (e.g. The Philadelphia Story , Adam’s Rib , My Fair Lady ) were a number of more sinister films. Characteristically, they usually revolved around women. Uncharacteristically, at least in light of his cultural legacy, they dealt with crime and murder, prejudice and hatred, destitution and failure. Gaslight (1944) dealt with an evil husband trying to drive his wife insane. A Star is Born (1954) remains one of the great condemnations of the American movie industry with its story of a young, naive actress eaten alive by the rigors and demands of sudden fame. And Bhowani Junction (1956), quite possibly his most unjustly overlooked triumph, focuses on the chaotic last days of Britain’s occupation of the Indian sub-continent seen through the eyes of a number of “half-breeds” who know that there will be no place for them in the new India. 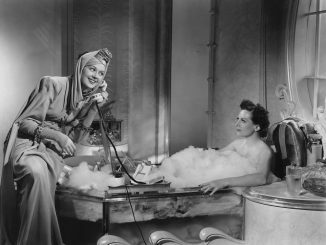 It it among these that A Woman’s Face (1941) finds sympathetic company. However, she is quickly pulled into a murder plot to kill a four-year-old child by a man who claimed to “love” her before she was healed. Torn between her desire to reform and her loyalties to the only man who has ever found her beautiful, Anna’s mental plight is distinctly noirish. Second, the film utilizes non-linear storytelling. In a curious decision, the entire film is told in flashbacks during a court case where Anna is being tried for murder. It is to Cukor’s credit that he manages to use this narrative device while still maintaining the audience’s suspense by not revealing everything about the story up-front. For instance, we know that Anna is on trial for murder…but for murdering whom? Third, Robert Planck’s cinematography alternates between competent yet standard lighting and blocking and moments of dream-like phantasmagoria. Film noir, with the primary exception of real-crime exposes like The Naked City (1948) and The Phenix City Story (1955), externalized the interior struggles of its characters with decidedly non-realistic sets, lighting, and blocking. Nowhere is this more apparent in A Woman’s Face than the sequence—coincidentally the film’s best—where Anna’s bandages are removed after her last surgery. Planck’s use of shadows, Dutch angles, and strategically placed props create a palatably mesmeric atmosphere. Cukor’s success in directing A Woman’s Face was largely overshadowed by the impact the film had on Crawford’s career. After years of being labeled Box Office Poison, A Woman’s Face marked a stunning surge of critical acclaim for Crawford. Four years later when she won the Academy Award for Mildred Pierce (1945), she credited this film as being responsible for starting her down the path to Oscar glory. But even putting all of this aside, A Woman’s Face remains a delightful dollop of dark chocolate for Cukor fans. A Woman’s Face is available for streaming on Amazon Instant and Vudu. It is also available for purchase on iTunes. Me Talk Pretty One Day: David Thorpe’s DO I SOUND GAY?